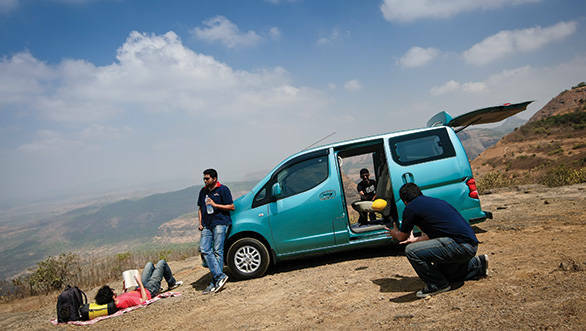 If you are planning a family vacation to your favorite hill station for the summer holidays or maybe that long pending trip with friends to that trendy beach getaway, a hatch or a sedan would just not cut it. What you need is a people mover with a breadth of abilities; after all getting there needs to be as much fun as the destination itself. What you need then is an MUV, and to find which one works best, we took six people movers out on the road in search of the ideal ride on a typical OVERDRIVE road trip. But first let me introduce the protagonists in manufacturer marketing speak, no less. The Quanto, aims to make everyday feel like a weekend. Its bigger brother, the Xylo, is built for 'long legged' fashion models and the Maruti Ertiga, meanwhile, promises you'd love Mondays as much as Fridays while travelling in one. Then there's the Nissan Evalia, which should move you like music does every time you get behind the wheel. There's also the trusty, reliable and a tad unassuming segment leader, the Toyota Innova to fulfil 'all your desires' and of course, the most recent entrant in the MUV sphere, the Chevrolet Enjoy. We also decided on a price cap to even out the playing field and chose the best equipped versions for all six which were priced under Rs 13 lakh. Now to our requirements. At OVERDRIVE, we don't believe in travelling light. We need options especially when it comes to what we wear, even if it is just a dive in a pool. As you can imagine, a large boot that's easy to load was a priority as we didn't want to carry luggage on the roof, changing the driving dynamics. So was passenger room; the last thing we wanted was to get touchy with each other. And the more people an MUV could seat after having swallowed up all of the luggage, the better. But that's not all, we were also looking at how these MUVs hold up on a day to day basis and how the drive in town and on the highway fully loaded. Lastly, the winner would need to plaster a smile on the face of every OD staffer/family/friends that helped out on this adventure, by offering convenience and comfort. We start our test with Mahindra's Quanto, the only 'small car' in this bunch. Small, because it measures less than 4 metres in length and with its 1.5-litre diesel engine, qualifies for small car excise benefits. This exercise in 'chopology' allows Mahindra to price the Quanto very aggressively and not surprisingly, it is the cheapest option here with the top of the line C8 variant costing Rs 7.87 lakh. 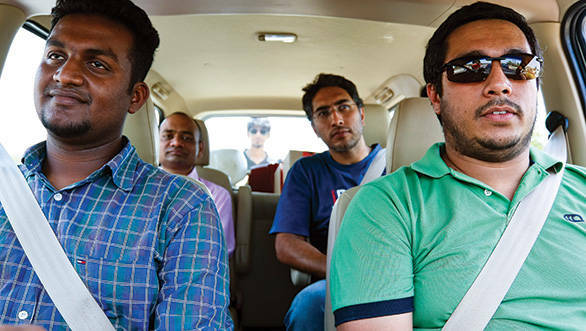 The Quanto's second row does seat three comfortably but you get bounced around a lot. 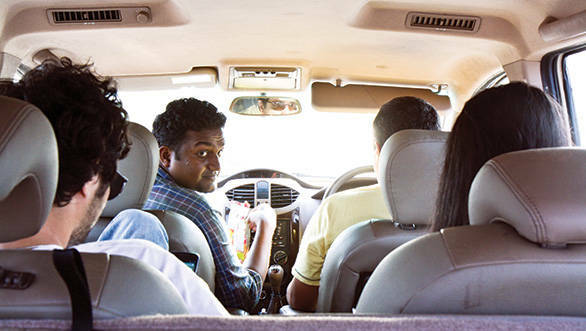 This brings us to the packaging of the Quanto and as we've said in our tests before, the Quanto is, for reasons of safety and convenience, a five seater. The jump seats in the rear are not practical for adults and with no seat belts and very little rear impact protection, it just isn't a viable seating option. In fact, you would probably be better off removing the jump seats and freeing up more space in the boot. It suffers in the looks department too with the stubby rear end making it look like a disproportionately overgrown hatch. Inside though, it still managed to fit five of us and the three in the second row seats weren't exactly uncomfortable thanks to 1500mm of shoulder room. Keep rotating positions and everyone would be quite happy on a long trip in the Quanto. It's also filled with little storage spaces and bottle holders so you're not constantly passing things back and forth. The parcel trays in the second row though could have been better designed. These can't take the weight of anything heavier than a sandwich and a small glass, and you risk a messy lap on bumps with anything heavier. 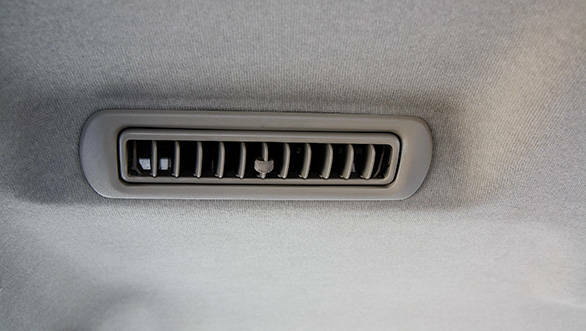 The Quanto is also the only vehicle here that doesn't have separate air con blowers for the rear passengers and on a hot day, this omission is very telling mainly because it takes forever for the car to cool. Luggage space is another area of concern. Even with the jump seats folded, the boot just isn't large enough to swallow up luggage for all five passengers. So, either you pack light or someone will have to take a hike. A lot more luggage has to be left out of the small boot. As far as driving goes, the Quanto's three cylinder 1.5-litre mCR100 engine makes a healthy 100PS and 240Nm torque on paper. It's uncharacteristically smooth for a triple too and is pretty tractable both at slow city speeds and at three digit speeds on the highway. It does sound harsh if revved, though, and isn't fuel efficient either. Add to it a small fuel tank and you will have to stop quite often on a long road trip, which isn't exactly convenient. The ride quality too leaves a lot to be desired. It works fine in town over mildly broken surfaces, but over bad roads, undulating roads or just deep potholes, it is completely out of sorts. It bounces and rolls and pitches and ends up throwing the passengers around. Even when loaded up with people and luggage it's quite uncomfortable over bad roads. Out on the highway the Quanto feels better, but not good enough. It doesn't inspire confidence at all and the inherited tall boy dynamics from the Xylo tarnish the driving experience. Chevrolet is the latest company to jump into the 'personal' MUV bandwagon, which like most other utility vehicle segments is showing signs of growth. Its contender here is the Enjoy. And its positioning is that of a perfect companion for multitasking as you toggle between work and play. It may not be the car that will singlehandedly pull GM India out of the red but it is a step in the right direction. It's priced at Rs 8.13 Lakh. The Enjoy is no head turner and chooses the middle ground with all its design elements. Nothing either positive or negative stands out in the design and this leaves it looking a little plain. Step inside the cabin and you're immediately pleased with the black and beige two tone colour scheme which gives the cabin an airy feel. 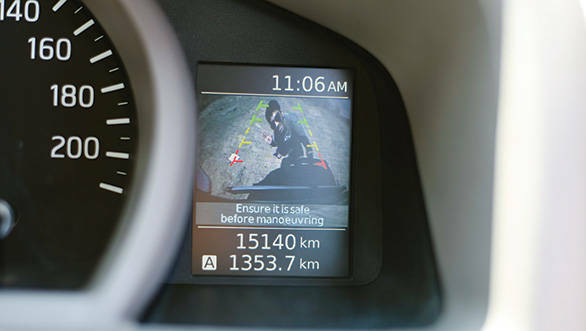 The layout of the central control unit and the instrument cluster also paints a visually pleasing picture. It's only when you look closely or actually use the switches and buttons that you notice the quality all round is sub-standard and the fit and finish is nowhere near the class standard. It leaves you with a bad after taste. We were surprised at just how much luggage the Enjoy could swallow. The seating meanwhile is comfortable with the second row captain seats sliding forward and back on rails liberating enough room in the third row to comfortably seat two. The third row has to be folded down to accommodate anything worth calling luggage though. But once folded down it does liberate a lot of room and though we weren't expecting it, going on just its external dimensions; it did swallow up all but one big bag. With just four seats again, we had to leave the fifth traveller behind as was the case with the Xylo. He'd probably have to take the next bus out. What was disappointing was the lack of stowage spaces, and cup and bottle holders all round. The front passengers still have some stowage, but the rear had none at all to put away the water bottles or other snacks. For a car that is meant to move 7-8 people, providing just two bottle holders is a big oversight. The diesel engine under the short snout of the Enjoy is the same Smartech unit from the Sail hatchback and sedan. The 1.3-litre diesel produces 77PS and 188Nm and is refined at low engine speeds. But as speed increases so do the vibrations and noise levels particularly inside the cabin. The Enjoy is however nice to drive around; the turbo lag isn't very pronounced and the gearing is well suited for the city commute. Out on the highway and fully loaded though it does feel stressed and easily runs out of grunt. Handling is average and there is considerable body roll. Moreover, the steering despite being a hydraulic unit tends to feel artificial and lacks feedback. The ride quality was a mixed bag feeling quite nice trudging around through towns slowly but getting unsettled over undulating surfaces. The Nissan Evalia, like the Ertiga, uses a monocoque design. But, unlike the Maruti, it was conceived as a panel van. And as a result, the space utilisation inside is class leading. Nissan had hoped that this would help draw in sales numbers but since its launch in September last year it only managed to sell 1400 units upto March 2013. Clearly one of the reasons for this performance is the styling of the car which makes it look more commercial than personal. It's a boxy van with the edges softened but that doesn't seem to be fooling anyone. But, as we found out looks can be deceiving and its popularity seems to be a case of judging a book by its cover. The XE base variant starts at Rs 8.87 lakh while the most expensive version, the XV, which we have on test here, is priced at that Rs 9.95 lakh. As we've said already the Evalia is no looker and its design lines do scream 'van'. But, step inside and you'll find that the cabin feels roomy and gives the impression that there is a lot of space on offer. Hard plastics and grey fabric do make the cabin look plain, but it does have a number of features on offer. It's the only vehicle in our line up to sport a reversing camera and the dials are augmented with a neat colour digital display. It is also the only MUV here to get keyless entry and start. We are not fans of the Evalia's driving position though. The visibility is good, no doubt, but the steering wheel is tilted forward which does nothing to detract from the fact that it's a van. The second row is a bench and so happily seats three and while there is ample shoulder room in the cabin, the sliding door mechanism means that the seats are not quite as wide as they could be. Also reminiscent of a van are the hinged windows in the second row that pop out but don't roll down, not very convenient if a family member suffers from motion sickness. The third row is also quite spacious and its seat back reclines more than any of the MUVs on these pages. 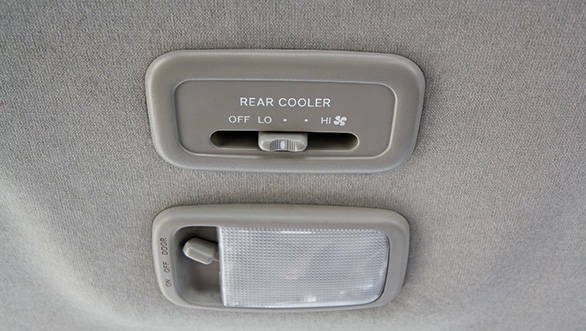 The third row also gets the secondary air conditioner vents, and honestly, if it aren't for the limited knee room, occupants would be rushing to the end of the van instead of taking the second row seats. Folding the rear seats releases the most luggage space here; it not only accommodated everything we threw at it, but it also had space to take in more. The Evalia sports the 1.5-litre K9K engine that puts out 85PS and 200Nm. It's a manageable engine but there is lag and it needs to be kept spinning above 2000rpm. The gearbox on the Evalia is smooth and has short throws making for effortless shifting around town. The ride isn't bad either, particularly at city speeds, but it can get crashy over the worst of potholes with a full load. Handling by MUV standards isn't bad, but when you have vehicles like the Ertiga around, the Evalia does feel less planted and one that tends to roll around more. It is however, more stable, and confidence inspiring, than the Mahindra twins. When Mahindra launched the Xylo they dubbed it as the ideal step up from a sedan, but it did not go down too well with the buying public. So, they refreshed the model in early 2012, improved its looks, added a few more features, gave it a new engine (for the top of the line E9 version) and got even more long legged models for its TV commercial. And it is the E9 that we have on test here. It isn't very expensive either priced at Rs 11.02 lakh, ex-Mumbai. The first thing that strikes you as new and much improved about the E9, is its engine. The new 2179cc, turbocharged, common rail diesel mHawk unit makes more power and torque - 120PS at 4000rpm and 280Nm between 2400-2800rpm, respectively - and is more refined too. It also manages to get the Xylo to 100kmph in a relatively quick 13.75 seconds and on to a top speed of 168kmph. The responsive engine also makes the Xylo pleasant to drive in town. Moreover, the steering isn't heavy enough to drain you. But, out on the highway the body roll does make its presence felt and high speeds, corners are best taken slowly and with a degree of caution. But, there's less to complain about when it comes to the ride. It is better than the Quanto and though they share the same wheelbase, the longer chassis and different spring rates work towards providing a less bouncy ride for the passengers. It still isn't great, mind you, but is less unsettling than the smaller Mahindra. In town the ride is plusher with fewer bumps making their presence felt while out on the highway the only thing that is felt are big potholes and expansion gaps on bridges. We also have to agree, the E9 does look more premium and palatable than the older version. More importantly, it looks better proportioned and far more likeable than its smaller sibling which incidentally sports the older Xylo's styling. Not much has changed in terms of design on the inside though, and so stepping inside the Xylo after a ride in the Quanto leaves you with a feeling of deja vu. The interiors are much the same as the Quanto but sport Italian leather upholstery and faux wood trimmings that lend it a more upmarket feel. It's also equipped with a gimmicky voice assist system that can turn on lights, wipers and turn signals. In addition, it gets cruise control and a multifunctional steering wheel. The Xylo, given its longer length, has a more spacious and comfortable third row. It can fit two full sized people, but as expected, knee room is limited. We needed it to accommodate a lot of luggage though and this was not possible with the third row in place. Once it was folded down it gave us a nice flat boot space which comfortably accommodated almost our entire luggage. 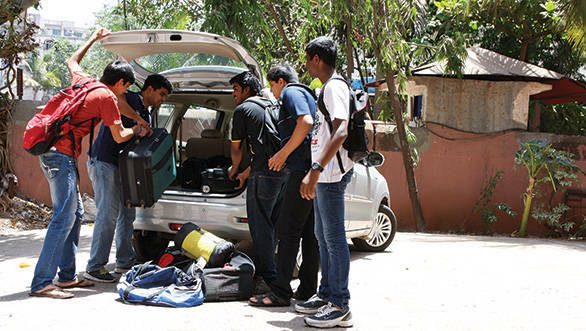 But since the E9 comes with two captain seats in the second row instead of a bench, meaning, only four people could travel in the Xylo with its boot loaded. So, even though four can travel in good comfort with ample room and lots of handy storage spaces and bottle holders, you would have to make this journey leaving one of your friends behind. It's surprising that Maruti took so long to make a serious upmarket people mover after experimenting in the utility vehicle segment with the Omni and the Eeco. 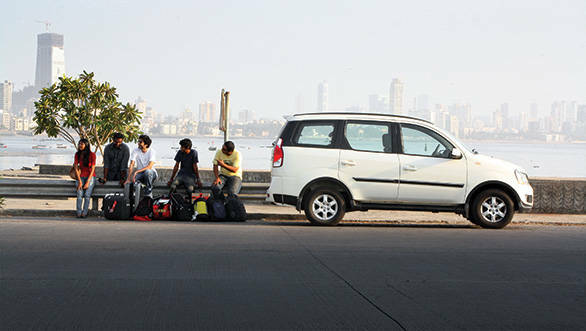 In April 2012 Maruti revealed its take on a multi utility family ride  the Ertiga. They also insisted that we would fall in 'luv' with it and called it a LUV or Life Utility Vehicle, instead of an MUV. It seems they were right too, because in just its first month of being on sale, Maruti received as many as 32,000 bookings. It had to do with the segment it addressed, of course, but more importantly its pricing was spot on. Even today it remains one of the more affordable MUVs one can buy priced between Rs 6.75 lakh for the base version and Rs 9.21 lakh for the top of the line ZDI. The Ertiga features a monocoque chassis that is based on the successful and popular Swift platform. It sports similar aggressive design elements with swept back headlamps, big flared wheel arches and a large air dam. It has a very car like feel to it and that translates to the interiors as well. 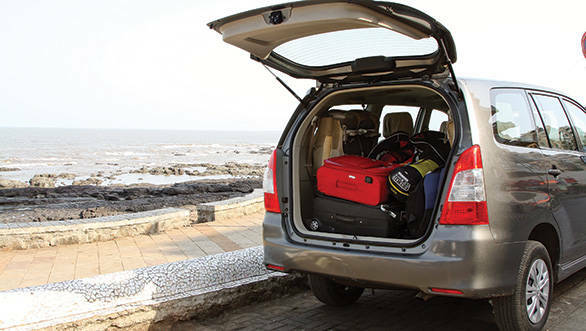 You don't have to climb into the Ertiga like the previous two MUVs which is a plus point for elderly family members. It doesn't hurt that the interiors too are carried forward from the Swift and are definitely the best to look at in this test. Five of us did fit in the cabin though the second row with just 1420mm of shoulder room can get a little tight depending on the shape and size of the three back benchers. It also gets 60:40 split seats in the second row that slide. These can be moved back to free up more knee room for the second row passengers, or moved forward to make more space for someone in the third row. This adjustability means that one can find a good compromise for a full sized adult in the third row as well. We on the other hand, with five accommodated in the first two rows, just folded away the third to free up 735 litres of space which was enough to swallow all our luggage with ease. 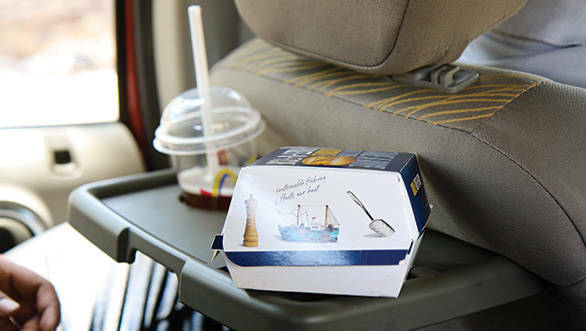 We also found the seats to be comfortable on our road trip and always had enough spaces to store our drinks and chips packets. But, yes, there was a bit of elbowing that went on in the second row. The Ertiga ZDI features the trusted 1.3-litre multijet diesel with DDiS and a VGT which produces 90PS of maximum power at 4000rpm and 200Nm of maximum torque at 1750rpm. The refined diesel has sufficient torque for city driving though it only completely wakes up after 2000rpm, but the lag isn't as pronounced as on the Swift. 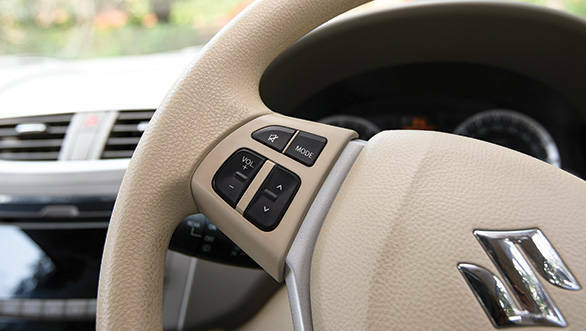 The short throw gearbox is light to operate and along with a light clutch, the Ertiga feels just like a car from behind the wheel. Ride quality is on the firmer side in town but it rarely gets uncomfortable. It doesn't throw the occupants around on bad roads either unlike body-on-ladder MUVs, and the stiffer setting actually helps when the Ertiga is loaded or is doing high speeds on the highway. It's also an easy car to live with on a daily basis. The Innova was, and remains, the MUV to beat, its high pricing notwithstanding. It is still among the best selling MUVs in the market today even though the product has essentially remained the same for nearly a decade. Toyota bills it as a 'do-it-all' vehicle and given its popularity, the Indian MUV buyer certainly thinks so; at least 6,000 of them - give or take a few - do, every month. Given our budget cap of Rs 13 lakh, the top of the line VX version could not be included in this test. Instead we have here the Innova GX which retails for Rs 12.83 lakh. 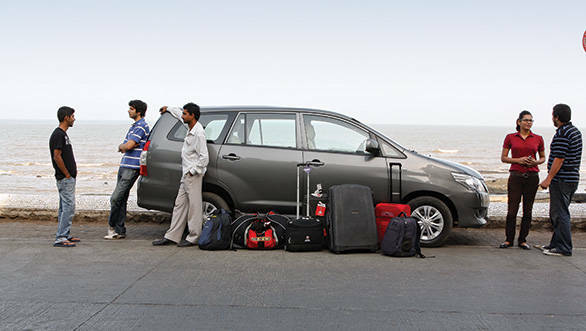 The Innova has built a reputation of reliability, dependability and comfort like no other MUV in the market; traits it carries forward from the vehicle that it replaced  the Qualis. It's also a favourite with transport companies, which regularly clock over two lakh kilometres apiece without worries. Its car like feel also means it's popular with private buyers. 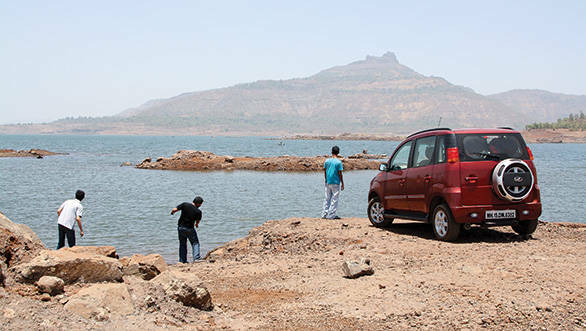 A close friend had one for many years and we did a number of fun vacation drives to Goa in it. 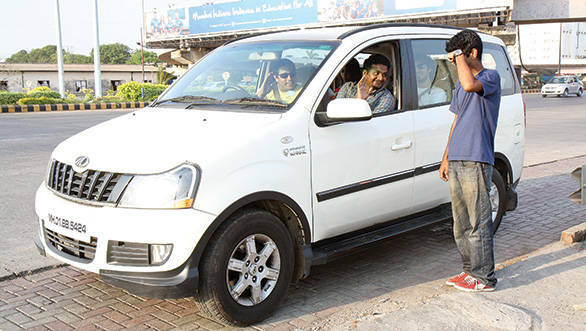 He only recently sold it when he upgraded to an SUV having clocked well over 2 lakh kilometres in it and was happy to get a great resale price on it. 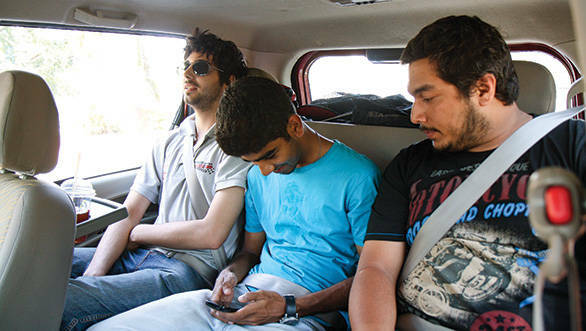 For our trip we were quite happy to pile into the familiar surroundings of the Innova. The interiors while not the most attractive, are well built, and the quality of the materials used is the best in the segment. You always get the feeling that you're sitting in an upmarket car rather than a people mover. The first and second row passengers travel in luxury with the second row sliding on rails in both the captain seat and bench versions. The third row is usable too but the seat is close to the floor and you end up with your knees in your face and little in the way of under thigh support. This mattered little in our test and after the rear bench was folded and hooked up, the boot easily swallowed our entire luggage with ease. We did have the seven seat version on our test so someone was left behind again but there is the option (at a few thousands more) to opt for the bench seats that will allow you to carry five. The Innova has made little changes to its power plant save for the addition of an intercooler and the 2.5-litre diesel mill makes 102PS and a maximum torque of 200Nm. At current highway speeds it runs fine but drive it harder and it gets noisy and bothersome. Handling though, is spot on, and you never get the feeling that you're piloting a nearly two tonne vehicle. The same goes for braking. Ride quality too is acceptable, and it only gets better with load. Now, the Innova might use a body on ladder chassis, but it certainly doesn't feel like it in the way it drives. It absorbs undulations, potholes and every other inconvenience that the road might throw at it with composure. So much so that our three passengers were all fast asleep in no time on our journey. To recap, the SUV we were looking for had to fit certain criteria. Space for at least five passengers and baggage, additional space to enhance the comfort quotient and road manners when fully laden were primary requirements. Efficiency, safety and finally value for money would add to the equation.Here is how they stack up. In last place is the Quanto. Clearly the sub 4-metre dimensions curb the practicality of this MUV. It also changes the physical character and that is something no passenger appreciated over the distance travelled. What redeems it yet is its pricing, it is the most affordable and offers reasonably good efficiency too. But if pricing and efficiency were the criteria you were looking for principally, buy a hatchback. The Chevrolet Enjoy comes in fifth, because ironically there is little to enjoy in this MUV. 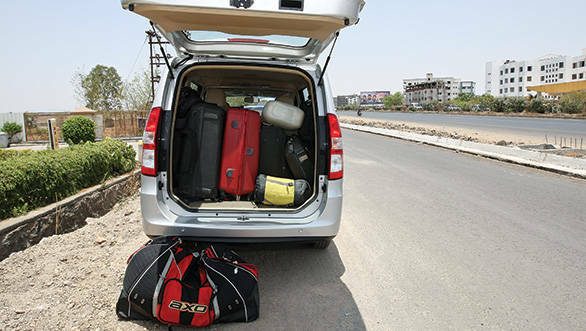 Despite the fairly large dimensions, practicality takes a hit because it just does not have space for 5 passengers and their bags, someone or something must be left behind. Yet the Enjoy in many ways has a very contemporary cabin and with four passengers alone and the third row folded down it's spacious, airy and comfortable. Definitely a significant step up from the Tavera if you can ignore the small quality issues. On the other hand when completely laden the behaviour of the Enjoy changes. It has the smallest engine on offer here with the least power and torque and that begins to show when this MUV is filled to the gills. 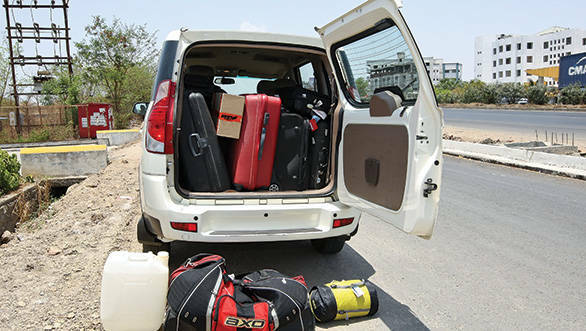 Up next is the Mahindra Xylo which also loses out because it just can't accomodate our primary space requirements. While it is significantly better to drive than its counterpart the Quanto, the additional length does not add value in terms of space management. The Xylo offers good fuel efficiency with decent drivability though I do wish its price also reflected a more confident driving feel with everyone aboard. Up next and this will surprise you is the Maruti Ertiga which comes in third. The answer to that ranking is its practicality. While we do admit that the Ertiga is a stylish, well designed and executed, and luxurious MUV it isn't the most practical. You can seat five passengers because in this price segment you get a bench seat in the second row but that still does not allow you to carry all your luggage in the boot with the third row folded down. So the Nissan Evalia finds itself in second place because if you wanted an MUV you wanted space and practicality and the Evalia is certainly one of the most practical and spacious MUVs in this regard. Five passengers with all their bags and still room for more is an unbeatable proposition. It adds confident and safe motoring with a full load to its abilities too and the panel opening with the low floor enhances the practicality of this MUV immensely. The pricing is highly competitive too and efficiency is best in class. The Innova then we think should simply be disallowed from competing in any MUV comparison stories. It is clearly the segment benchmark and no one has come close to figuring out how to beat Toyota at this game. Why others, even Toyota haven't figured out entirely how to improve the Innova and that is why it has never undergone any significant changes in the last six years. But a word of caution, the Innova is the most expensive MUV to offer the same levels of equipment as the rest in this test and its diesel motor is the least efficient. The competition is catching up rapidly, it would do well for Toyota to drop the premium it charges.